Wow, what can I tell you about my german shepherd. I guess I'll start at the beginning. His name is Black. An odd name maybe but he's actually named after my first military working dog that I deployed with to Kuwait in support of Operation Iraqi Freedom. Ten months into that deployment the original Black passed away from tumors but I'd swear his personality and character lives on in my shepherd. When I rescued Black from a veterinary clinic he was maybe a year old and was dirty and nasty, he wasn't house broken and he was pretty much a stray, he even had a large open wound on his neck. Black though is by far the smartest dog I've ever met, there is no fence that could hold this dog if he didn't want to be, maybe he owes that to being a stray when he was younger, I don't know but he's still here and is about 6 years old now. Black learned all the military dog commands in a very short amount of time and he loves to work, he would have made a great working dog. 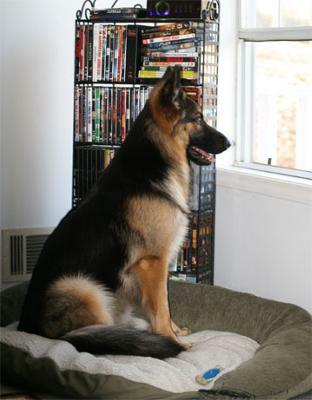 The picture taken is of Black waiting for me to come home, my father took the picture while I was at work. Black has the most beautiful coat of any shepherd I've ever seen and I get asked all the time if I breed him or if he's registered. In fact, I recently rescued a female german shepherd that was supposedly spade and not only is she gorgeous but she's now the proud mother of seven puppies from Black, and my family couldn't be more excited. I eventually wanted one of Black puppies but I just had my second son and the puppies came a surprise to us all. Anyway, I know every owner loves their dogs but Black is amazing, and we love him to death and can't wait to see his puppies grow up. I love that picture of Black, but have to say it was not Daniel's father who took that picture. It was just one of the pictures I took (I'm Daniel's mother). Black is a great dog and does have the most beautiful markings of any shepherd I've ever seen. He's also part human (we think) because he is so dang smart and extremely caring and protective of his loved ones. He's now a father of 7 and is not only a wonderful father to his new family but still a much loving and obedient mate to Maya the female shepherd who was suppose to be spayed when Daniel got her. How exciting to see Black's picture on your site, he's very humble and deserving at the same time. You can tell I'm a very proud doggy "Grandma".